Sounds like one of the Ninja turtles. We have Leonardo, Michelangelo, Donatello, Raphael, and now, their cousin Carpio. I know it's a stretch, but hey, it's fun. 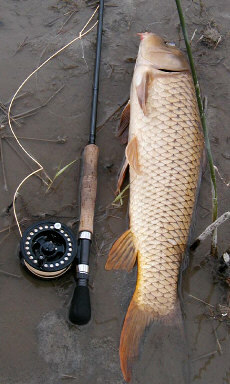 First, let's realize that there are many, MANY variations of carp out there. They are a survivor and can live almost anywhere. 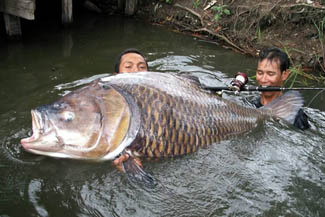 Their body color is usually a brown to dark olive green, depending on the water it is found in. 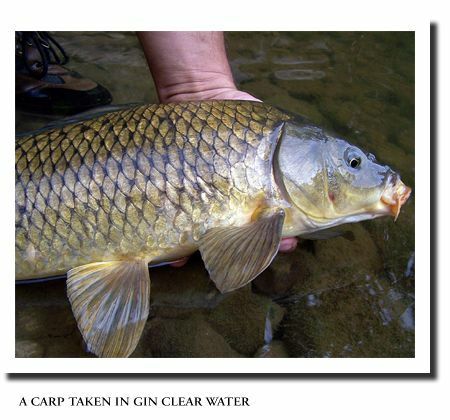 However, make a note that the common goldfish or Japanese Koi you buy in pet stores are common carp! They are large and are not very attractive except to others of their own kind. Typically, these fish can live for upwards of 50 years, get to a length of 60 inches and weigh as much as 80 pounds or more. This fish is in a class all it's own and it would be difficult to mistake one for anything else. Their appearance is that distinctive. Waters that are either slow moving or completely still are where you will find these lumbering aquatic giants. They spend a great deal of time near the bottom rooting for food items. For this reason, they prefer a body of water with a soft, muddy bottom. This has also earned them the nickname of "garbage fish". The time for spawning is not readily available, but the egg laying females will drop as many as 300,000 eggs at a time. Add to that the fact that they are known to be able to spawn several times per season and the numbers are staggering! The young hatchlings are a prominent food source for natural predators like northern pike and largemouth bass, so only a few reach maturity. This fish was originally a native of Europe and Asia, but has been transplanted into many parts of the world. That was easy since they adapt so well. Bu they are considered a pest in some places and are hunted actively for the sake of population control alone. These guys are like Morris the cat (the Nine Lives cat food cat). They aren't picky about their food. Honestly, these are scavenger fish and will eat almost anything offered to them. This "koi" fish is happy to eat a vegetarian diet, but will take crustaceans, small fish, and even dead fish if the opportunity is there. So they can be caught on anything you can attach to a hook, guys and girls. These are a tasty food fish as long as they are cleaned properly and have the mud vein carefully removed. Break that vein and the meat is ruined, so you need to learn to clean these babies. This fish is mixed with others to make the Jewish favorite Gefilte fish. They can be baked, fried, made into soups and chowders, baked into casseroles or just about any method you like. Your imagination is your only limitation!